Now you can video tour the six-bedroom, nine-bathroom CitySpire triplex on the market for $100 million. Prudential Douglas Elliman chair Howard Lorber took CNN through the 8,000-square-foot, octagonal penthouse on the 73rd to 75th floors of 150 West 56th Street. The apartment, the most expensive on the market in the city, has 3,000 square feet of wrap-around terrace space. The dining room seats 30, and the the master suite lies directly under the dome that caps the building. 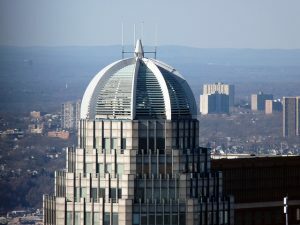 As a bonus, the penthouse owner controls when the dome is lit every night. Developer Steven Klar, the president of The Klar Organization, bought the unit as raw space for $4.5 million in 1993 and spent at least as much to renovate it. Lorber said that since the listing went live in late July, “we’ve had a couple of very important showings,” with a few more scheduled. Lorber’s words reminds us of a quote from steel magnate Leroy Schecter, who is merging two of his condos at 15 Central Park West to sell for an equally bank-breaking $95 million.